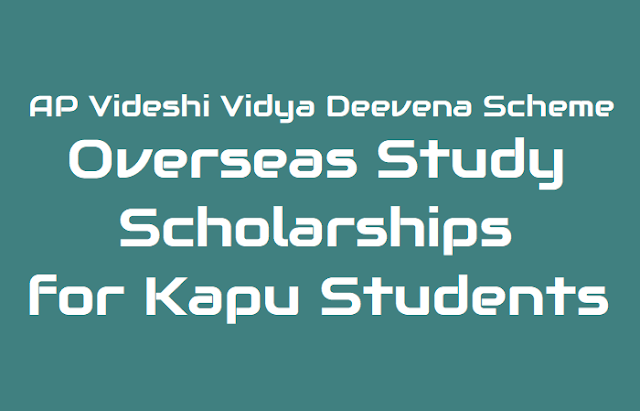 Overseas Vidya nidhi, Videshi Vidya Deevena Scheme, Overseas Scholarship for kapu srudents, AP Videshi #VidyaDeevena Scheme 2018 for studying overseas for Kapu youth, online applicaion form, last date for apply online, https://epass.apcfss.in/, results/selection list, scholarship amount and how to apply details are given here. Andhra Pradesh State Kapu Welfare and Development Corporation Limited (APSKWDCL), a Government of Andhra Pradesh undertaking, has published the AP Videshi Vidya Deevena Scheme 2018 notification for studying overseas for Kapu youth and Applications are invited for grant of Rs.10.00 lakhs as financial assistance to Kapu, Balija, Telaga and Ontari students from economically weak families of Andhra Pradesh who aspire to do their Graduate (only for MBBS) , post Graduate or Ph.D Courses abroad and CPM(Certified Portfolio Manager)courses in the US equivalent to Chartered Accountancy(CA) /Cost Accounting(CA) courses in India in Foreign Universities. a.. Installment I -An amount of Rs 500,000 (Rupees Five Lakh Only) shall be payable to the students upon production of the landing permit / I-94 card. (Immigration Card). b. . Installment II -An amount of Rs 500,000 (Rupees Five Lakh Only) shall be payable to the students upon production of the 1st Semester/Term results. 3. Sanction Proceedings specifying the amount of Rs 1,000,000 (Rupees Ten Lakh only) will be issued to the individual towards fees and living expenses by way of a grant subject to his/her joining the Course and the Candidates selected by the Selection Committee. The sanction proceedings can be made use of by the Candidates for obtaining a Visa from the respective Embassy. 4. One way economy class ticket (lowest fare tickets)for the shortest route shall be payable upon production of valid visa and admission particulars. 5. The total visa fee shall be reimbursed to the student upon production of valid visa and receipts of visa fee payment. AP Videshi Vidya Deevena Scheme for studying overseas: AP Videshi Vidya Deevena Scheme 2018-19 for studying overseas for Kapu youth, Overseas Vidya Nidhi Scheme, Overseas Vidya Deevena Scheme: Andhra Pradesh State Kapu Welfare and Development Corporation Limited (APSKWDCL), a Government of Andhra Pradesh undertaking, is introducing the “Chandranna Videshi Vidya Deevena Scheme (2018-19)” for the economically weak Kapu youth in Andhra Pradesh. Under this scheme, a financial assistance of Rs 1,000,000 (Rupees Ten Lakh Only) shall be granted to the selected applicants through the prescribed process. This assistance shall be for studying overseas in recognized universities for tuition and living expenses. 6. The Student shall be eligible for an educational loan of Rs 500,000 (Rupees Five Lakh Only) from any Nationalized bank at prevailing rates of interest. The Corporation shall coordinate with the Nationalized Banks in securing the education loans to the selected candidates. 7. The awardees are permitted to supplement the scholarship allowances by under taking Research/Teaching Assistance ship, as available from the respective universities. 8. Upon release of the 2nd Installment, a Utilization Certificates shall be obtained from the student with the endorsement of concerned University Authorities for record purpose under the scheme. 2. The annual income limit of the family will be Rs 600,000 (Rupees Six Lakh Only) or below. 3. At the time of admission into the foreign institute, the applicant should have received his/her Intermediate certificate/relevant Graduate Degree for applying for MBBS courses or Graduate/PG certificate for applying for PG/Ph.D courses. 4. PG courses includes PG Diploma courses of One year, and One and Half year duration. 5. The scheme includes the study of CPA (Certified Public Accountant) and CPM (Certified Portfolio Manger) courses in the US, since they are equivalent to Chartered Accountancy (CA) / Cost Accounting (CA) courses in India. 6. The applicant should 35 years of age or below while applying. 7. The awardees cannot be considered for the second or subsequent times as the individual can be awarded only once in a life time. 8. Studying in courses from recognized universities from USA, UK, Australia, Canada, Singapore, Germany, New Zealand, Sweden, Netherlands, France, Denmark, Russia, Philippines, Kazakhstan and China (Philippines, Kazakhstan and China only for medicine) will be considered for this scheme. 10. The applicant should not have availed himself/ herself of any amount under any other Government scheme for the same purpose. 11. In the case where not all scholarships are availed by eligible candidates students already studying in 1st year or going to join 2nd year in eligible foreign institutes and courses as above my apply for this scheme. 1. He / She should have a valid TOEFL / IELTS & GRE / GMAT. 2. He / She should have obtained admission into an accredited Foreign University. 3. He/ She should possess a valid Passport. 4. The Candidate should make his/her own efforts in seeking admission in an accredited University / Institution Abroad. 5. The selected candidate has to join the concerned University within one year of communication of selection. On expiry of this specified period of time, the award will be automatically cancelled and come to an end. No request for extension of time for availing the award is permissible under the Scheme. 6. The candidate can change the course or University (in the same or any other eligible country) of study or research. Permission will be accorded on a case by case basis, subject to the approval by the State Level Selection Committee. 7. It shall be the responsibility of the candidate to obtain the appropriate visa for a country where the admitted university is located. 8. Students studying in 1st year or going to 2nd year in eligible in foreign institutes and courses as above may apply with a letter of enrollment from their studying institute, stating their status as a student and year of study in the said institute. 9. The application should be complete in all respects and should be accompanied by all relevant documents. The applications, incomplete in any respect, are liable to be rejected. Eligible candidates should fill their application online at the www.kapucorp.ap.gov.in & www.apepass.cgg.gov.in websites in the prescribed format. 2. Aadhar Cards of the applicant. 3. Caste certificate issued by competent authority. 4. Date of birth proof. 5. Intermediate or Graduate degree mark sheet. 6. Passbook details of Savings Bank Accounting Nationalized Bank (account must be in the name of applicant). 7. Passport size photograph (in JPEG format up to 50 KB size). 9. GRE / GMAT or equivalent qualifying exam / test score card. 12. Bio-data of the candidate. 1. Interested students shall apply at www.kapucorp.ap.gov.in & www.apepass.cgg.gov.in in prescribed format along with documents. The registered students shall be shortlisted for grant of scholarship by a State Level Selection Committee headed by the Principal Secretary, BC Welfare.